Ever wonder what a journalist sees when he's on the road, covering the news? 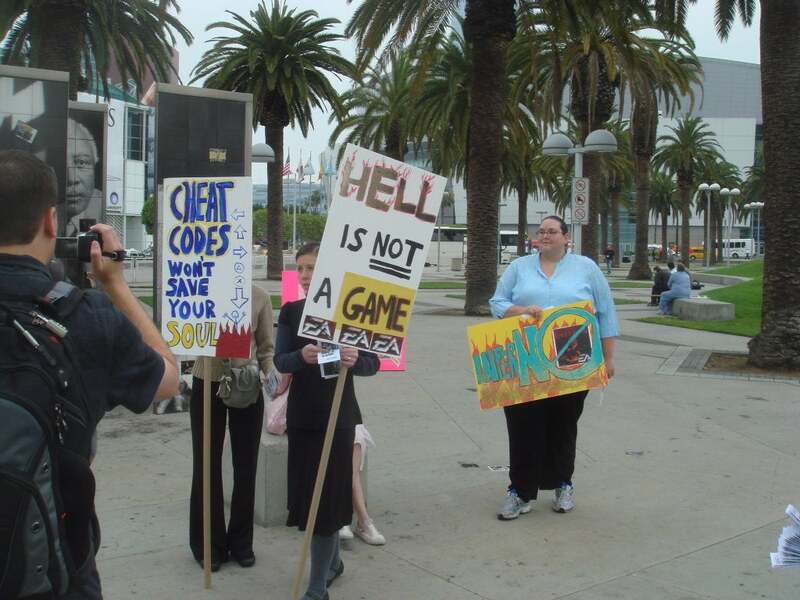 Well, here's a snapshot of a day-in-the-life at a trade show dedicated to video games. If you're reading this story from a site other than pcworld.com, you're missing out on all the candid photography that goes with it (click here for the full package). 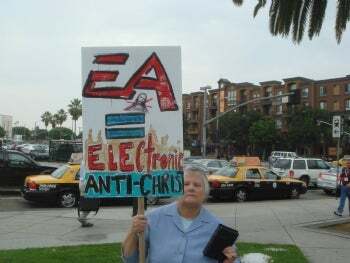 --"It's time to trade in your Playstation for a Praystation." --"Our high score is in heaven....and we hope that you'll join us on the leaderboard." --"Those who fall victim to the trappings of this virtual hell game will not have to wait long until they find themselves in REAL ACTUAL HELL where they will not be given any weapons or power-ups to protect themselves from the fiery demons, razorblade babies, or spewing bodily fluids." 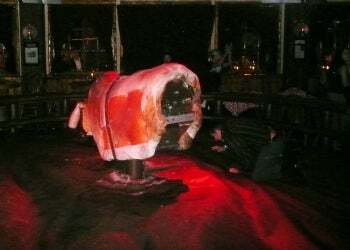 --"The ever decaying youth and slovenly adults who engage with Dante's Inferno are a victim of our society's pointless need to flirt with Satan..."
Before even hitting the show floor, I saw this mess. What's the deal here? They were trying to build up a huge heap by collecting all the free swag other companies were giving away.You deposit anything some other company on the show floor gives you, and they give you a clean pair of underwear. Seriously. Scarier part: I almost considered taking a pair. 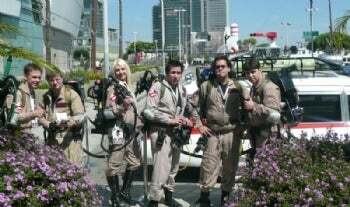 I'm more than a little psyched for the Ghostbusters game, which launches here in the states in a matter of days, so I could appreciate this last bit of promotion: A gang of people dressed for "battle" and the original Ecto-1. The only bad part: It was blasting the Ray Parker, Jr., song for the whole show. Two signs that E3 is back to its former glory: A plethora of beautiful women paid to truss up in costume and roam the show floor. The last few years felt like a vaccum cleaner convention. But when you start seeing beautiful women interviewing the booth babes, then you know everything is back to "normal." 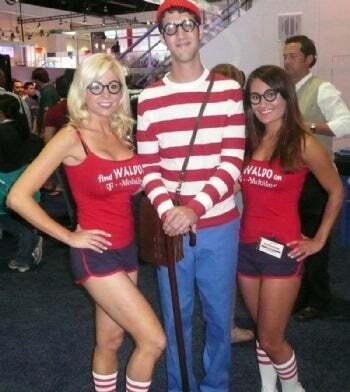 Waldo, found. Though I can understand why one might miss him. As a true nerd, I found myself more than a little eager to check out the Ubisoft game, R.U.S.E. 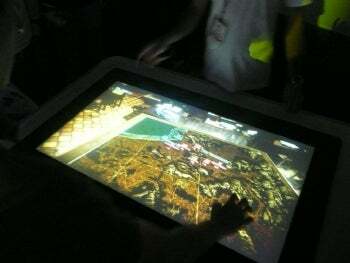 Imagine a simplified, fast-paced real-time strategy game that is being made to play on touchscreens--like this $20,000 table right here (or plain ol' PCs and the Xbox 360). So, if you have a higher-end Tablet PC you might be able to play this when it comes out in early 2010. The developers say that the game will be very scalable, though I have my doubts. And if you have an extra 20 grand lying around for this awesome peripheral, call me. The world's loneliest booth. 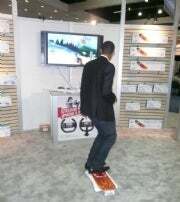 In a year piled up with peripherals, it was tough to get excited about a faux skateboard deck that you strap onto your Wii balance board. Hey, I will give them points for at least trying. It's not like they just cut out a piece of plastic and piled it on top of another. Oh. "And the award for the peripheral design that you never knew you had a need for goes to...." Nyko for the DSi Zoom Case. 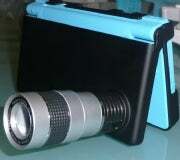 Because you wanted to slap an 8X optical zoom on a 0.3-megapixel camera. Shaky, low-resolution images? Make my portable completely awkward? Sign me up! 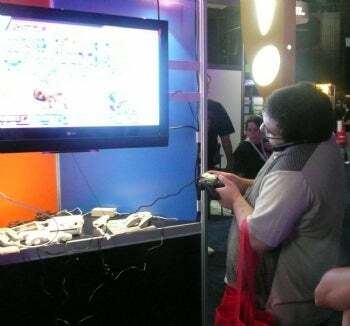 Please do not disturb this man while he's playing a game. (I'll give him bonus multitasking points for being able to simultaneously play a game, field phone calls, and still keep his valuable swag swinging on his arm.) The device he's stationed near is a decent idea, though: A $20 Wii dongle that'll let you plug in and use NES, SNES, and N64 gamepads on virtual console games. 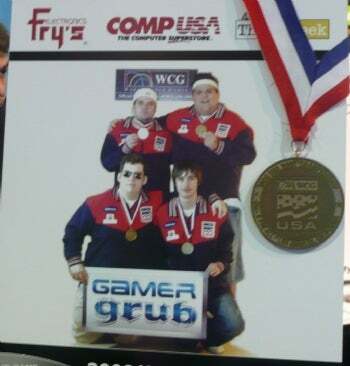 I have no idea what's better: The fact that there's snack food being specifically crafted for gamers or the fact that these guys are the equivalent of the Wheaties box atheletes. But according to the Gamer Grub marketing material, each of the flavors of their snack food (Pizza, PB & J, Wasabi, and Chocolate) are packed with vitamins and neurotransmitters. I have to say, I tried a couple and they actually tasted all right. On a related note, I drafted someone to help me with a little taste test, but I'm having a tough time uploading the video. I'll add that link in here when it's set. 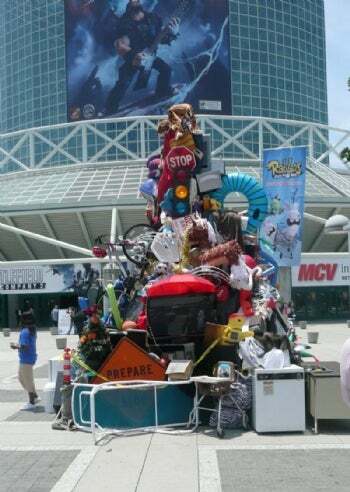 Another thing that goes hand-in-hand with gaming trade shows: Ridiculous amounts of ridiculous swag. 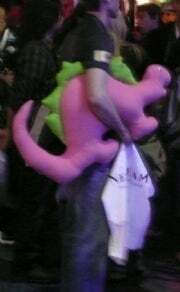 I did miss a couple photo ops of people loaded down with ludicrous quantities of gear (my first camera battery died), but I will say this: Congratulations, sir, on winning your...pink... dinosaur. To his credit, the gent walked straight past a free-T-shirt-hungry crowd by the Fatal1ty booth. Hey, the guy has to have some some sort of quality-control standards, right? 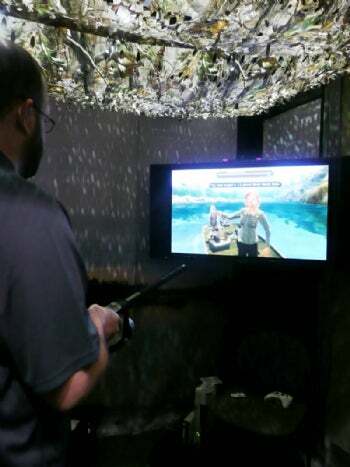 I don't know about you, but after tromping around a trade show, I like to kick back, down a cold one, and try to catch a fish on the digital river. Come September, for $80, you can cast off with Pro Bass Shops: The Strike. With all the detail going on here--cruising around lakes looking for a good spot and dropping a line alone or with buddies--it looks like fun. Would I call it the John Madden of fishing games? Maybe not. One word of warning, though: If you're fighting a particularly big one, try not to break the prototype pole in your big goon hands. Sorry about that, guys. Then, of course, come the parties where you go to blow off some steam after you've submitted stories. Some of the venues during the show: A private concert with Jay-Z and Eminem, a rooftop party at Def Jam's West Coast joint, a nightly Rock Band jam session at a swank downtown hotel, pool parties (Happy 20th birthday, Gamepro! Next year, you'll legally be able to drink!). But this shot comes courtesy of the Bethesda party at Saddle Ranch on Sunset. And on that note, time to say goodbye for another year. I'll need it to catch up on sleep.